I’m not much of a thrill-ride rider. You won’t find me on Expedition Everest or Tower of Terror. But, my family and I absolutely love Seven Dwarfs Mine Train! This picture is me with our almost 5-year-old son, who could have ridden this all day. Thanks so much, Deb, from Focused on the Magic for hosting Wordless Wednesday each week! Check out the other posts on my site while you’re here, follow me on Pinterest, Twitter, like me on facebook, and/or subscribe to my blog. (You’ll enjoy Daily Doses of Disney on my facebook page!) 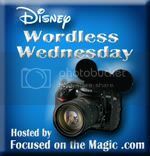 Then, don’t forget to click on the Wordless Wednesday icon to check out more Disney blogs and their Ride posts! They were finishing up Mine Train when I was at Disney last year. I hope you’ll get to catch it sometime. It’s a great ride! Ohmygoodness, ADORABLE. Isn’t that a fantastic ride?!? It’s in such high demand, that we didn’t get to ride it nearly as many times as we would have liked to, on our last trip! So stinkin’ fun, and that first drop is the best. Thank you! It’s one of my favorite pictures from our trip…and it really is a great ride! I love that it’s an exciting ride AND it’s a ride-through story, like their slower attractions. This is, hands down, my favorite picture from the Wordless Wednesday thread. The joy on everyone’s faces (especially your son’s!) is as if it were primed and ready for Disney to use in a promo advertisement. Love this! Thank you, Maureen!! His face does look perfect for a commercial or ad, doesn’t it? 🙂 He absolutely loved this ride. I’m so glad I have this picture to treasure for years to come. What an amazing moment to capture on camera. I hope I get some good pictures like this when I take my two toddlers on their first Disney vacation in October!!! Any tips??? How exciting! I hope you have a GREAT vacation with your two little ones! My advice is to take lots of pictures with a good camera. This one was just taken with a little, Canon point-and-shoot, not camera with an attached lens, but it’s one that takes good, print-worthy pictures. Have a big memory card (and an extra, charged battery if you can, or a back-up camera) so you can take LOTS of pictures … and at a good resolution, so you can blow them up if you want later. You’ll be sure to get some priceless faces! And probably funny ones of them not cooperating (they’ll be funny later, anyway!). Another little tip: My sister was devastated when she lost her camera and all of her photos at Disney World. I label my camera with an address label and put my cell number on it, in case something were to happen! I’m so excited for you! Have fun, and thanks for checking out my posts!